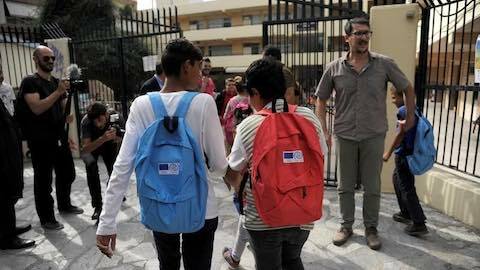 European cities are joining forces to tackle challenges arising from the continent's refugee crisis, in an initiative launched this week in Athens, through which hundreds of thousands of refugees and migrants have passed since the start of 2015. "This is a European problem, you can't share the fundamental principles of the EU like solidarity and humanity and say 'not in my backyard'," Kaminis told the Thomson Reuters Foundation. The move comes amid a climate of rising tension between newcomers and city locals across Europe. Fighting in Syria, Afghanistan, Burundi and South Sudan has pushed the total number of refugees to a record 21.3 million in 2016, the U.N. refugee agency UNHCR said this month. Nearly 170,000 people have arrived in Greece - the main entry point into Europe for refugees and migrants -- by crossing the Mediterranean so far this year, according to UNHCR. Some 900,000 refugees and migrants arrived between the start of 2015 and early 2016, 80 percent of them passing through the capital Athens. "When the refugee crisis erupted in 2015, the majority of refugees passed through Athens, at a time when both the city and the country were completely unprepared to deal with massive inflows," Kaminis said in a phone interview. "European cities need solidarity with refugees on three levels: among neighbourhoods, among cities in one country and among European cities." Laia Ortiz, a deputy mayor of Barcelona, told the Thomson Reuters Foundation one challenge European cities faced is that EU funding to support asylum seekers is channeled to national governments rather than cities. This is one issue to be tackled in the initiative, said Athens' Kaminis. "We hope that once European leaders see how cities are stepping up to welcome refugees - they will help us scale up the initiative and allocate more funding to it," he said. Kaminis said European cities can use Solidarity Cities to share information on refugees, to lobby for funding for cities to house and integrate them, and to make pledges to receive asylum seekers. A dozen cities including Amsterdam, Barcelona, Leipzig and Gdansk have so far expressed support for the initiative. The agreement is just one example of cooperation between city and town halls across Europe to try to cope with the continent's worst refugee crisis since World War Two. In March, Barcelona signed an agreement with the Greek island of Lesbos - which has seen a huge influx of migrants - to advise it on how to deal with the discarded dinghies and life jackets littering the island. Some efforts are off to a slow start, however. Barcelona's Ortiz said the city had offered to accept 100 refugees from Greece and Italy, but "the Spanish government won't allow it, saying it's not cities' business." Europe: "European 'Solidarity Cities' Unite to Help Refugees"